The Liquidity Pyramid is a model created by John Exter (1910 – 2006) an American economist, member of the Board of Governors of the United States Federal Reserve System and founder of the Central Bank of Sri Lanka. 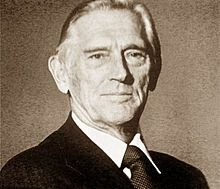 In the 1950’s he started to explain the economy in terms of an inverted pyramid. The basic idea of the liquidity pyramid was to convey the concept of how easily an asset could be bought or sold. In other words – how liquid it is. At the top, he placed the most risky, least liquid assets and at the bottom, the least risky, most liquid assets. Here, it might be helpful to consider the idea of ‘wealth.’ We do not really own anything; merely we have claims to ‘things.’ ‘Wealth’ is a claim to or a command of resources (land, labour, capital) that have the potential to make life ‘better’. To explain, a bond is a claim on someone else’s capital and time, a share is a claim of ownership of part of a company, a real estate certificate is a claim on an acre of land. They can be considered investments because they pay dividends. Cash is a somewhat different asset in that it provides no yield in itself but is a claim to everything else. Above this he placed US Treasury Bills, above this – corporate bonds and above them a whole range of foreign currencies, stocks, bonds etc. At the top of the pyramid, he placed Third World Debt – the most risky investment in his day. If the approach seems a little US centric, we must bear in mind that post WWII the US comprised towards half the world’s GDP. Capital moves up and down the pyramid according to the level of confidence in the economy. In times of perceived plenty, the center of gravity moves upwards into riskier asset classes as the pyramid grows. 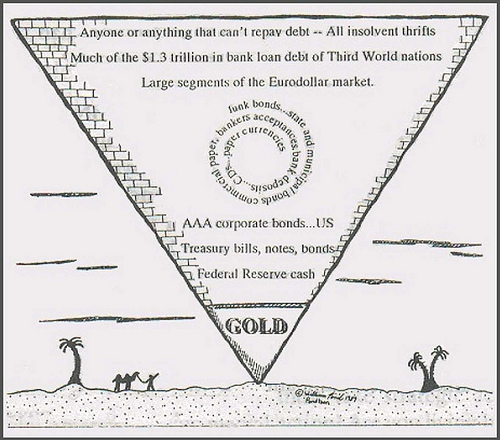 In times of fear, the pyramid shrinks and capital gravitates downwards into bonds, then cash and finally gold. Extremes of both greed and fear are easy to find when looking through world Economic History. Mass greed – at the height of the dotcom bubble in 2000, Pets.com – a company with no profits or virtually no assets was valued at some $300 million, towards 7% of the world’s above ground stock inventory at the time – valued at approximately $4.5 billion. Mass fear – In times of fear, the bottom of the pyramid can command massive purchasing power. During the Great Depression, the same $100 note that would have bought 1.36 General Motors shares in 1929 would have bought 6.25 GM shares in 1932. Yet the most remarkable bargains can be found when capital attempts to burrow its way through what most of the public deem to be the bottom of the pyramid – cash. During the Weimar Hyperinflation for example, in which the Papier Mark became worthless, the whole of the giant German car manufacturer Daimler could have been bought for 18,700 oz of gold ($22.5million in 2014). Whole apartment blocks in Berlin were sold for 1000 oz of silver. Aerial view of the Daimler plant of Mannheim, around 1920. Exter boldly predicted that eventually the Federal Reserve Note would, like all other purely fiat currencies eventually reach its intrinsic value – zero. In our next article, we shall consider the nature of today’s world liquidity pyramid and the implications on the purchasing power of gold in relative terms should confidence be lost in what we mistakenly call a US Dollar. In the next article, we shall consider the global liquidity pyramid of today.